Social media platforms continue to steal a living courtesy of the long-awaited arrival of James Milner’s uniquely dry sense of humour. The Liverpool vice-captain is proving stern competition for his own tribute ‘Boring James Milner’ Twitter account with no let up in his string of trending posts. Milner couldn’t resist the chance to launch yet another internet phenomenon after sealing a place in the Champions League final with Liverpool on Wednesday. When asked if he would be celebrating with an Italian wine, the midfielder joked he would ‘stretch out’ to Ribena. The Englishman made sure to fulfil those plans, as evidenced by former Liverpool left-back Stephen Warnock. 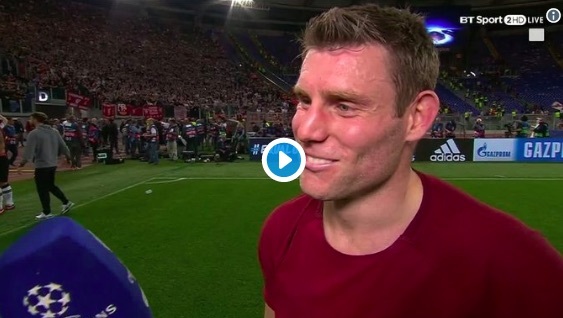 Milner didn’t leave Reds short of bonus entertainment after a special night in Rome, making a joke over his own calamitous own-goal. The 32-year-old has good reason to sport a beaming smile, having played an instrumental role in Liverpool’s Champions League run thanks to his competition-record nine assists. Milner has similarly been integral to the Reds putting a top-four Premier League finish in their own hands, which could be cemented with a win at Chelsea on Sunday. Alongside Liverpool’s dynamic front three, Milner is a leading candidate to be preserved by Jurgen Klopp between now and the showdown with Real Madrid in Kiev.